We don’t tend to eat a lot of vegan meats, but Seth tried the Beyond Meat General Tso’s at the Whole Foods hot bar and really liked it. My meal planning has been a little disjointed since we joined the CSA since I don’t know what we’re getting until the day we get it, sometimes the day before. I grabbed a package of Beyond Meat to keep on hand in case I needed to come up with something kind of quick and didn’t really know what to make. The CSA box yielded yet more broccoli and thus my plan was formed. I searched around a little and found a bunch of vegan General Tso recipes, but they all wanted you to bread and fry tofu or seitan and that really wasn’t what I was looking for. I finally found a recipe for just the sauce – it came together in almost no time flat, although I reduced the amount of sugar in it a bit. All I did was slice up some bell pepper and onion, chop a little broccoli, and voila! I sautéed the peppers onion and broccoli for a few minutes, then added the Beyond Meat strips and let them get warm (I took them out to thaw about an hour or so before I started cooking). Once everything was just about done, I added the sauce and gently stirred everything to coat the veggies and strips. We served it over basmati rice with spring rolls (we buy them frozen at Whole Foods). 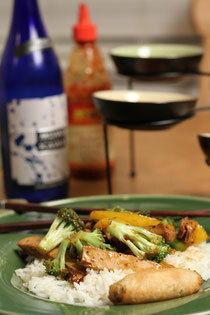 I really liked this and will make it again sometime and plan to try it out with tofu as well. Hiya! Just wanted to stop in and say it was nice to meet you at the Dough 1 yr anniversary vegan potluck! I'm sure I'll see you around at more events. I've been meaning to try those beyond meats for awhile because I keep hearing great stuff about it. Maybe the next time I'm at WF, I'll pick 'em up. Hi Ketty, It was nice to meet you guys as well. The potluck was a lot of fun and a great way to meet other vegans. Looking forward to seeing you guys around.